The Index of Multiple Deprivation (IMD) identifies areas of deprivation in each local authority area, and also for smaller areas within each local authority area known as Lower Layer Super Output Areas (LSOAs). These are similar to Middlesbrough's electoral wards. The 2015 IMD was published by the Department of Communities and Local Government. Living Environment Deprivation domain (9.3%). Each of the 32,844 LSOAs in England are assigned a score based on deprivation levels and also a rank based on each of the scores. Rankings for the 326 English districts and boroughs are also calculated. Middlesbrough has a rank of average score of 6 (increased from 8 in 2010) meaning it is the 6th most deprived local authority area in England. Whilst the IMD produces results for LSOAs, it is possible to estimate national ward ranks based on the LSOA scores. 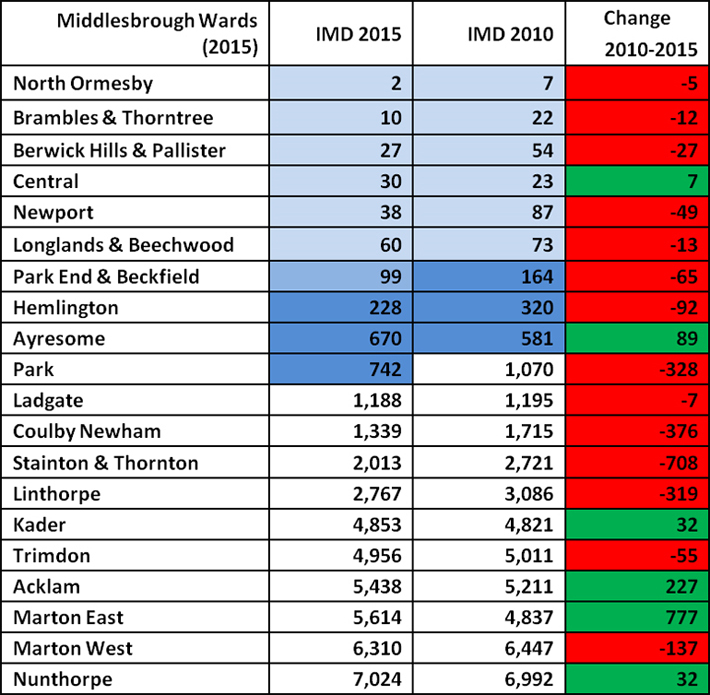 The table below shows the IMD overall rankings for Middlesbrough wards for 2015 and 2010 and also highlights rank change, with ranks being out of 7,522 (number of wards in England), where rank 1 is most deprived. Of the twenty Middlesbrough wards, six have improved their ranking and fourteen have got worse. At ward-level the biggest improvers amongst the most deprived areas are Central (from 23 in 2010 to 30 in 2015) and Ayresome (from 581 in 2010 to 681 in 2015). All six Middlesbrough wards in the top 1% most deprived wards nationally have increased their ranking (become more deprived), the most significant being North Ormesby which is now ranked the second most deprived ward nationally. You can compare IMD for each of the domains (income, employment, health and disability, education and skills, barriers to housing, crime and living environment) in each of the wards in Middlesbrough. Download the Middlesbrough wards by IMD national rank 2015 document.